Alabama Department of Archives and History Public Information Subject Files – General File, Bus Boycott, SG6945, folder 305b. Alabama Department of Archives and History, Montgomery, Alabama. Originally, the NAACP legal team had hoped that the Rosa Parks case would be able to bring the issue of discrimination on Montgomery buses to the Courts. After publicity from the boycott seemed to tie-up the case in state court, though, they felt they needed another case to build on the momentum created by the boycott. Attorneys Fred Gray, E. D. Nixon and Clifford Durr, with the help of the NAACP legal team, decided to create a class action lawsuit with a group of plaintiffs who had been forced to comply with laws requiring separate accommodations for black and white passengers on Montgomery buses. Aurelia Browder, Susie McDonald, Claudette Colvin, and Mary Louise Smith all agreed to sue in federal court. 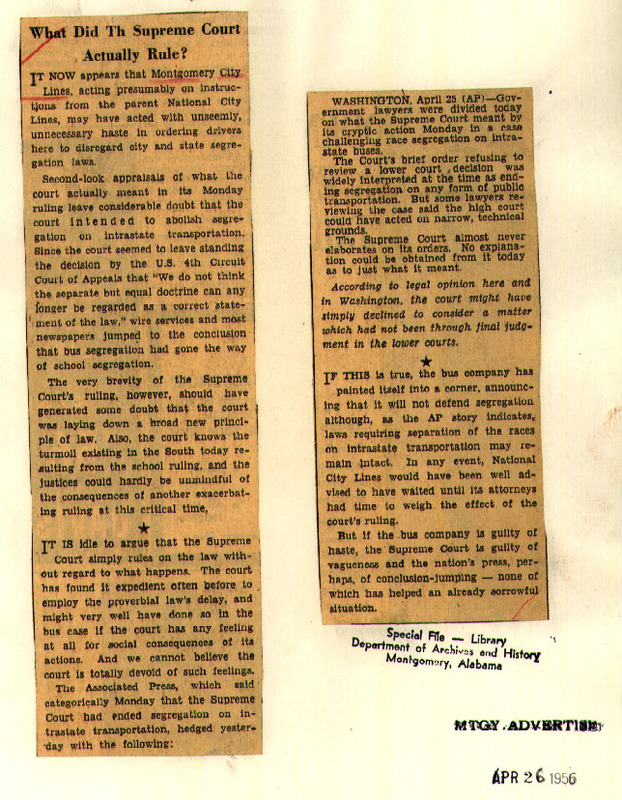 On April 24, 1956, newspapers across the country reprinted an Associated Press story regrading a U.S. Supreme Court decision on a South Carolina bus case. The story incorrectly reported that the Court’s action banned racial segregation on all public buses (South Carolina Electric and Gas Co. v. Flemming 224 F.2d 752 (4th Cir., 1955)). Montgomery City Lines, the local bus company, ordered buses desegregated within 48-hours, only to reverse the order once the mistake was realized. The newspaper story below illustrates local reaction in Montgomery. Meanwhile, Browder v. Gayle progressed through the courts. A three-judge panel of the U.S. District Court for the Middle District in Alabama ruled on June 19, 1956 that the Montgomery segregation law violated the Fourteenth Amendment. The U.S. Supreme Court affirmed the decision in November 1956. The City of Montgomery implemented the Supreme Court’s order and desegregated all buses on December 21, 1956.